The market has done what we've expected over the short term and traded down into the SPX target box -- but it has yet to answer the bigger questions. Right now, the decline off the high looks like a very nice A-B-C, so unless the bears can make some new lows, they could be in trouble. We're simply going to have to wait for the market to tip its hand here. 1) The top is in. 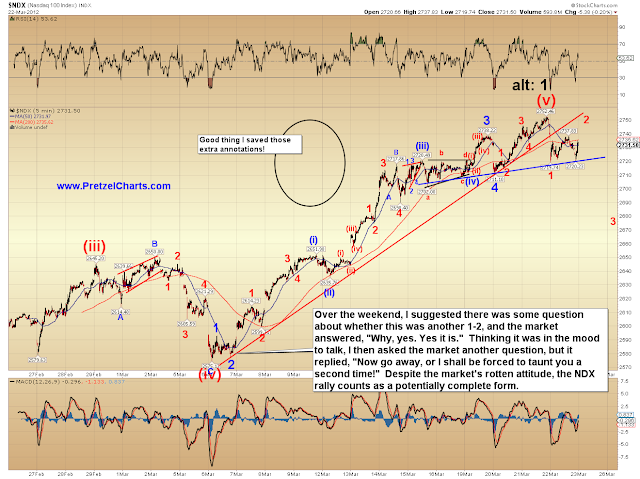 2) The recent top was only wave (1) up, with (3),(4), and (5) still to come. Here's the NYA chart showing its key overlap. I've looked at a lot of charts tonight, and while I remain in favor of the top being in place, there is as yet absolutely nothing to confirm that -- in fact, given only the information that is in the charts right at this moment, one could argue that this was simply a correction to the rally, and that correction is basically over. So until proven otherwise, shorts who haven't taken profit need to be quite cautious at these levels. If this was simply a second wave decline, then the next wave up should be powerful. 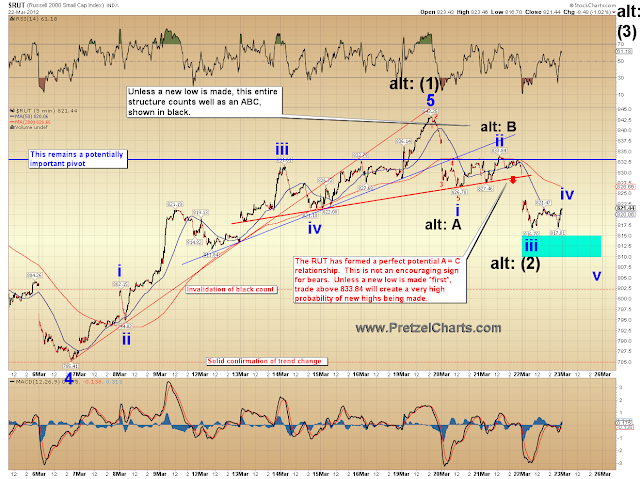 RUT has the same appearance of a "perfect" 3-wave decline. This is possibly why RUT has, so far, failed its target slightly. 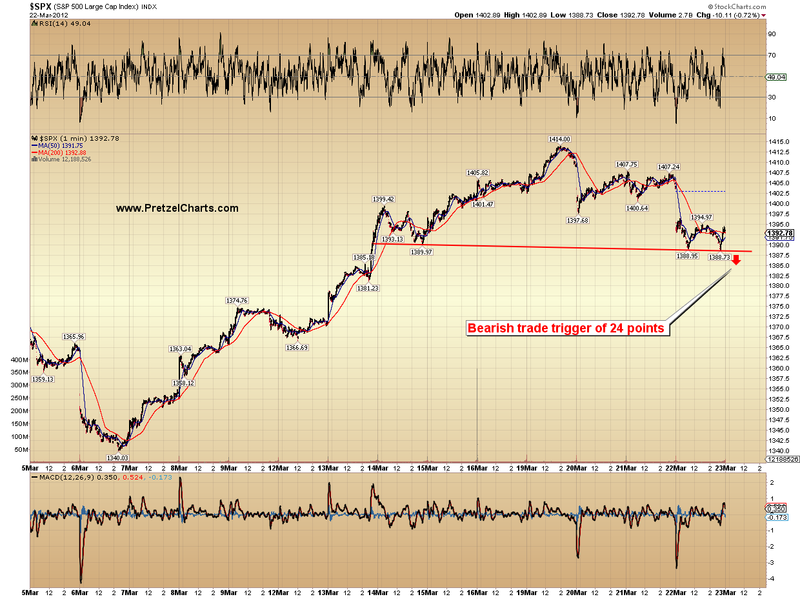 Also of interest, a bearish trade trigger has taken shape in SPX. 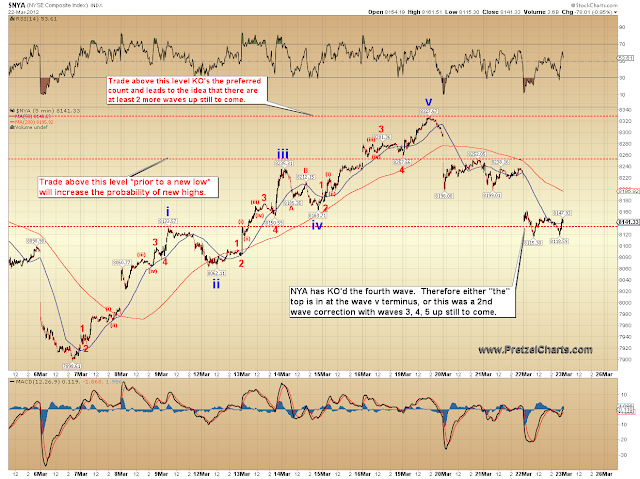 NDX, being the rebel that it is, looks more like a first wave, or a-wave, down. So this might be some evidence in support of the preferred count. In conclusion, at this exact moment there is simply no way to have a solid idea of what's coming next. What happens on Friday or Monday should provide some answers. 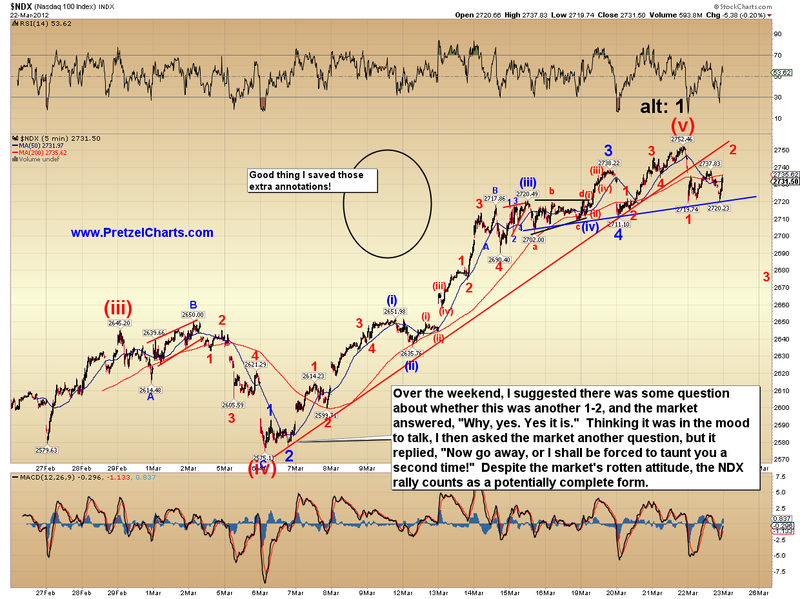 Is the market going to create another wave down and complete an impulse move off the highs? Or was this just another pause in the ongoing rally? Place your bets with caution -- and as I've said before: cash is a position too. Trade safe. Your mother was a hamster, and your father smelled of elderberry... you tiny-brained wiper of other people's bottoms. Here is a follow-up chart of eur/$$ posted on last thread. Someone asked what the blue arrows represented, they were two peaks of resistance that was broken, look what happened after they gave way, straight up. But is has rolled over now somewhat. Interestingly, this did not seem to move the Globex mrkt. at all. mrkt now appears set up to continue down. Goodmorning PL! If we are on wave 1 down, then what would a likely % retrace for wave 2 up (possibly on Monday) be? Thanks a lot I A!! If I owned TVIX (I did not and am ST oriented right now) I would be calling the SEC right now to lodge a complaint. Exactly what was that 27% decline all about and who held the short shares (could CS be stupid enough to get caught with their hands in the cookie jar)? Of course, they will form a committee, have lots of meetings, go out to lunch a lot, produce lots of paperwork, and then send the shareholders 29 cents per share in about 3 to 4 years to settle. CS definitely had their hands in the cookie jar (directly or indirectly). In fact, the cookie jar's contents were spilled all over the table for the taking. The situation was just too easy to take advantage of. ES/120 ~ ~ At this point it appears it was a bear flag, a big one. strangely, eur/$$ pop had little effect. The BBB retraced but not to the opposite BB, that would have been all the way up to about 1400 [I mentioned I thought it would never get this high]. She simply fell too far too fast and needed to do some catch up. Within the regesssion trend channel, I like to see that it is remaining in the lower portion of this channel [below black line] after the initial impulses; this usually means a prolonged move in that direction and it does not end until it starts wobbling up into the upper portion of the R.T.Channel, some smallish trial moves up until it changes direction. Logical measured moves on the stochs. ...Monty Python reference in 5th chart. lol. Lost what bet? Missed that. PL, we had some 'blog success' yesterday where five ppl covered or mentioned a ST bottom at the exact same time [Tim & Tammy, DustDevil, Albert, JuiceBoxBoy, and I]. IMO this represents objective analysis as all prolly use different methods to see this transition, a triangulation with various methods. Thanks for providing a venue where we can post our ideas. It was from awhile ago: If the US or Israel wasn't doing a weapons demo on the Iranian sandbox by 3/22 I would change my screen name to the above....but through negotiations I was able to arrange a release upon the commencement of hostilities. I'll second that, it is great to hear everyone's thoughts and ideas and take them into consideration. Plus this place is civil, kudos PL. Good morning PL Much obliged for the hard chart work and the "caveat emptors" always good to have you watching our backs. One question....in yesterdays posts you mentioned your position in CVX was "leveraged" and I'm really curious about how a pro like yourself positioned your trade. Did you use options, equity short, ...etc. I'm not trying to get the minute tactical details....just your positioning strategy. Morning PL et al. I am in the camp that the Russell is pretty nuch finished with its move down. Also in the camp that for some reason SPX will want to take another runup to 1400, those round numbers are just too hard to resist..... Am planning to close IWM puts, bought a light long position with the intention of adding to it. Am watching several candidates for a short position, RL and CRM, Nice call on CVX there PL, I think I will be holding the last of the FAS put position for a little longer to see if we get to 97. AM long AMZN and looking for a pullback and retest of the cup handle breakout in NFLX, Took a long put butterfly spec position in AAPL May contract puts, Long 575/short 2 560, Long 545 puts for 1.25. If and When AAPL does correct, this longer dated position is in play to possibly triple. Excellent choice of names.....No mass. If 1390 ES holds as a pivot for EW4 retrace (short term charts) then more down ahead. Interesting article demonstrating 2 different ways to look at the RUT. Marvelous negotiating skills.....were you on the dream team for OJ? Good morning Katzo. From the auto-EW label of 4 and the PTI of 72, it should be shooting up right now. But it doesn't have any impulsive look to it. Of course, this is pre-market. 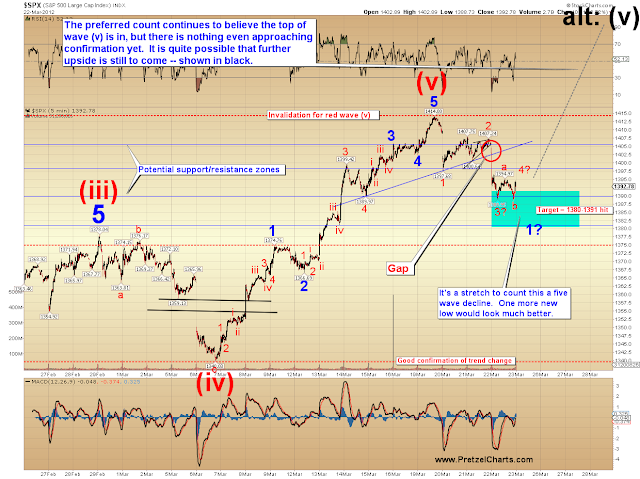 So it looks like the auto-EW count is wrong after all, and PL's short term count, 2nd chart on blog, is correct. That would be a "5" where esignal's "3" is at the top. And what is unfolding would be a wave 1 down. Nice spotting on the 20/50 MA cross and the two consecutive bear flags. These add to what I said. I'm sure you remember the "asbestos" debacle. When one reads through the net effect of the litigation and subsequent remuneration to those affected...you find that the typical claimant received $2000. 200 plus companies went out of business. Only in America. I'm all about just dropping Elvis and Katy Perry videos, and lot's of Johnny Walker on'em. That'll turn a culture around in a heartbeat. Comments on talks about Q-end window dressing? lol I dropped out of law school after my first year, so I wouldn't qualify. US unemployment rate for 19-25 age group is about 15%. In case you haven't learned the lesson yet: stay out of TVIX. Albert, do you know the exact date? End of June? New home sales below expectations. INDU right at support. Watch for a bounce here. A break would be very bearish. I agree and expect an extended wave 3 down. Out of ES long at 1382.25 Expected a bounce, but it broke through and there is no conviction to go up, so I am out. Flux says we're in the middle of a trend, not at a reversal. You might want to sell at 1383 and eke out a tiny profit. I bought some put options the day I published the first series of charts. In the case of CVX, since my read is "ending diagonal" and the move out of a diagonal should be fast -- in those situations I like to use a reasonable options position, because I expect the speed of the move to outpace the time decay. I think leverage is fine, as long as you don't over-use it. If this is still wave 3 of 1, would it be a good point to short as soon as DJI breaks through support? Thank you...I was hoping you used ops. In the money? I should add, though, that in this market, I'm not going to count my chickens until the fox is done guarding the henhouse. Can't make needles in the hay while the sun shines! ES is trapped between to FPC (fractal pivot confluence) lines at 82.5 - 84.25. Will probably hang out here till 10:42. Then, if it doesn't look like there's renew buying interest, a long downtrend should start and run till about 3 PM. You are awesome! A man of your word. No inverted truth here. I like that. It's only a matter of time until you get your old name back. Thanks, DD. If we break below 1380, I think we are headed down to 1372 (min.) today. The more I looked at your prediction, the more probable it seemed. Thought it might actually happen. Especially when Israel voted for action last week. Yep... I expect a backtest... I also expect the major european indices to retrace early next week part of this week's drop... Nein? They fell hard and fast, ja! I'll find out and get back to you and Al. If SPX gets back above 1395, expect a larger rally to unfold, possibly into the 1405-1410 zone -- specifically, watch for an eventual fill of the gap shown on the 2nd chart. Because it approached 10:42 on an upswing, that probably was just a reaction, so now down from 85.5 ,,,, RE 1372 -- Not so sure. There's FPC support at 75.25 and stronger support at 71.75. One eye on market indices and critical levels, another eye on the stubborn AAPL (and QQQ with it), which like a sloth does not release from its 600 branch... If AAPL holds and (!) moves up, bears' hopes vanish... Now if AAPL sells off from 600, things may get very interesting next week. PL, any prospects for APPL from an EWT perspective? CVX's new low is confirmed by momentum, which usually means a lower low after the correction. Seems to confirm the count. Central bankers get together to talk loose money. The Fed is hosting the world's leading central bankers to discuss the impact of the money printing some of them have been doing. Those joining Ben Bernanke include the BOE's Mervyn King, the BOJ's Masaaki Shirakawa and former ECB Chief Jean-Claude Trichet. Do you think they'll be meeting around a fire that is using benjamins for fuel? I can potentially count Apple as complete -- parabolas are very hard to count, though. Regarding bottled water -- I can't remember which comedian said it, "Have you ever noticed Evian is 'naive' spelled backwards?" If ES blasts through ES 87.25, bear bets are off for the time being. PL, what are you looking at on the upside of a correction b4 heading back down again? Filling the gaps $110.70 (roughly) or $108 (roughly)? Good call on CVX by the way! If that was it for the fifth wave, it's pretty friggin' anemic. Alright, I need to get some rest -- I have "real person" things I need to do tomorrow, which actually involves getting in my car and leaving the house and everything! Which means I need to be awake during normal person hours. AAPL circuit breaker tripped. What's the deal? ty -- The $108 will probably be filled reasonably soon. I suspect the other one won't get filled on this run, but will have to see the shape of any rally and reassess in a bit. Two critical paths from this point: (a) a retest of ES 1394-97 will tell much - if broken through, may climb to 1412-15; if failed, further weakness down to ~ ES 1370; (b) a further move from here down to ES 1370-1375 could produce a bounce up similar to that on March 6 with about 20 points upside. and who put out warnings a month ago about leveraged etf and mentioned tvix was bad news. yes, ive been in the bidness a few years and know a few ppl and things about these leveraged instruments. they are there to take yo monies as said. take heed. a lesson learned. gluck and no crack so i see so no need for mindless drivel. tvix was playin possum. World Trade Volume 3 month rate of change (in green) with 6 month smoothing (in red) as of the end of January 2012. Stopped out of ES short at 1390.25 Ouch. Now, it may be heading back down. My finger is on the button. PL....I think billabuster has a "way with words" and just might be able to help you with some creative thinking regarding your posting titles. Although I can't figure out if he's from Texas or Louisiana? Shorted again at 90.25 Currently holding 1 ES short. As today is op/ex Friday, activity in the afternoon shall be shy. Any call within the current range (ES 1375-90) is risky, IMHO. I would at least wait for a retest of 1394-97 before deciding on going short or a move down to 1370-75 to go long. Positioning in the middle of the lower price channel is risky. 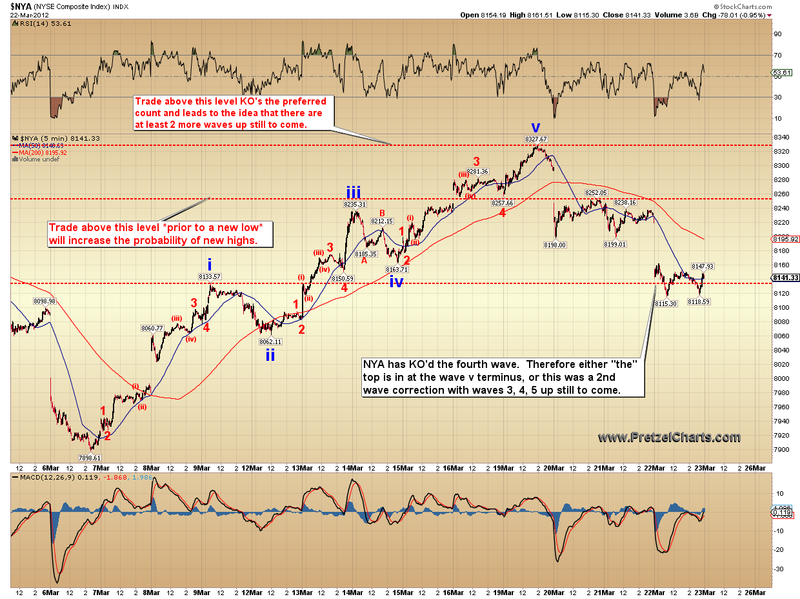 As NDX keeps relentlessly strong, I have a feeling that we go up from here. BATS is claiming a system overload that may be involved in the AAPL erroneous trade. DRG are you thinking IWM has a pretty good upside here? I appreciate your thoughts. Flux shows only chop here till EOD. Being OpEx, take a break. Watching AAPL options, 595 Put expiring today was about $0.50 1/2 hour ago, now $1.64. Crazy stuff. Does anyone think AAPL is breaking down or viewing this as short term noise? Thanks for posting that chart. I'm not familiar w/ the grey bars. What makes a candlestick grey vs. what I'm familiar with, red/green? Thanks for your thoughts. 600 should be a ceiling today, as open interest on weekly call options jumps from that level up. A move beyond 600 today would create damage to these call sellers who may be in the countdown to retain the premium previously collected. From the same perspective, a move below 595, maybe even 590, would not be that harmful to put sellers, so we shall remain within this range through the EOD. Now, moving to next week, I see as of now some potential for a decline to 580-590. No trading advice, even because the options context is very dynamic. I am thinking IWM takes another run at the 83.30 level. Longer term charts over longer timeframes show a megaphone pattern developing. Looks like after this morning we are in a A leg up so would expect a test of previous highs. Yeah I am on the same page. I just went long some RUT calls when the RVX crossed below the RUT on my 1 minute chart. It does appear that more upside is coming. I don't know for sure. They's esignal proprietary indicators.I don't know how the algorithm works. The red/green don't mean the usual. They mean "sellers" (red) and "buyers" (green). The dark gray means inside bar. Light gray means outside bars. I get this feeling...someone is watching me, watch the markets. Thanks. That's why I've never heard/seen them being that they are proprietary to esignal. mrkt going up, bounced right off my EW4 tgt level or 80 es. And never touched the 86 level it had to in order to break this up wave, touched only 88.50 es. we will see where it will take us but up is the direction. Could we be retracing to ES 94-96 before going back down? Was that it?... Stop grabber and down without me? That's what it did in overnight futures. Maybe it is repeating the pattern for RTH traders? The bear flag has served its purpose in putting in a T-Horn pattern at the low, previous posted chart not updated. And this earlier 30-minute chart I posted has come true, not updated. This is the chart I am working off. Action is according to the 30-minute predictive chart. 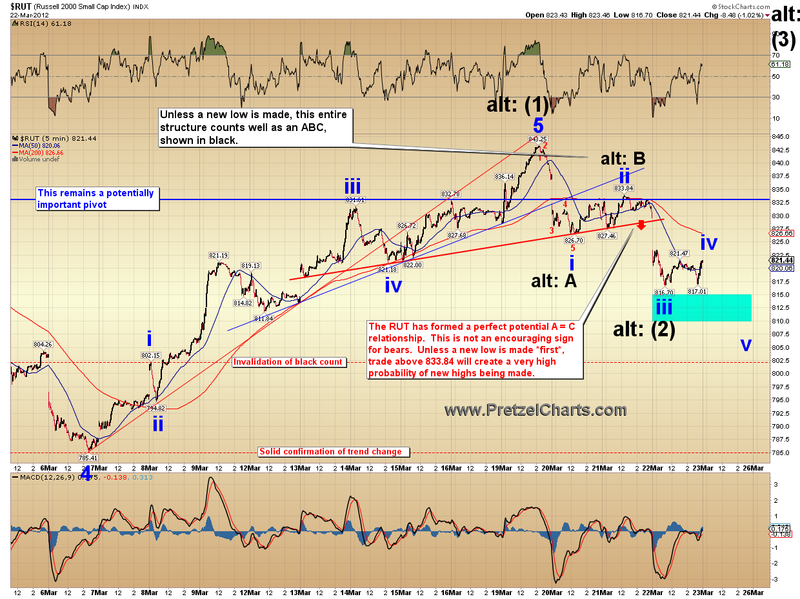 I like the look of 30 minute industrials and am leaning towards PL's Alt count for this reason. Nenner has an upside S&P target of 1449 and a time target of April 19. Here's a simple and current chart showing how price is moving into the lower of the two recent gaps. FWIW. And here's a link to the print version of that chart (so non subscribers to StockCharts can see the annotations). If I'm not mistaken, it should update even for non-subs if you hit that update button. Follow up on charts below. The take-away is that the low PTI informed that the EW5 would be aborted, that it would not form a lower low below the EW3 level of 79-80 es. In this case it was a double kiss of that EW3 level putting in a T-Horn pattern on the 120 chart. Is this the start of a final EW5 run to 1430 area? 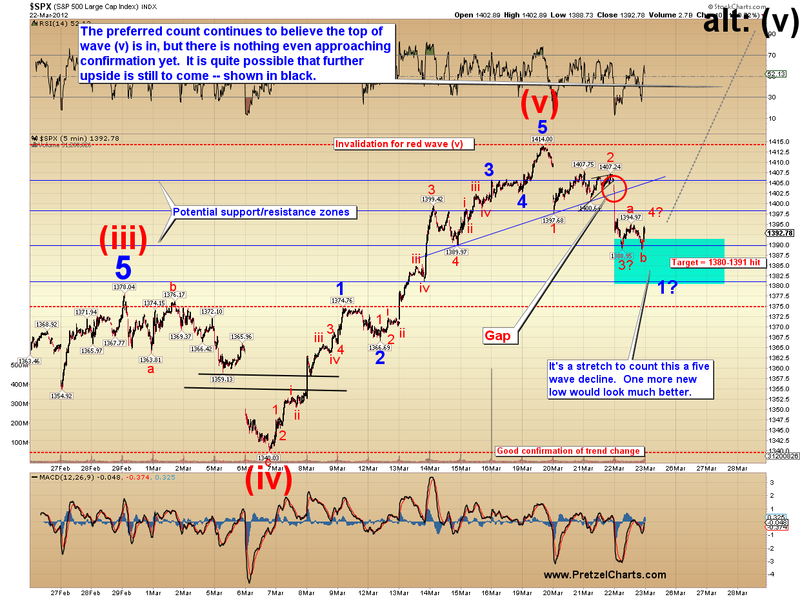 EW count says a hold of 79-80 and no break of that important level will initiate the final rally. Both cases have things going for them and against them. ES 95 is the next important level, we will see how that is played. To be a bit more exact, I get an EW5 high of 1413.50 based on the 120 ES chart. Profit Taking Index, a proprietary eSignal calculation. On my chart I noted that it was low and speculated that the EW5 down would abort. It's hard to say but it's possible that spike may be the top of wave c of wave 4 at this moment (it's really weird, isn't it?) but chances for market going up toward the end of the day are still there... That's why it's difficult to trade in corrective environment. Given today's Q OpEx, so there is a bit of whipsawing to get everyone's clock clean. It'll be pushed around quite a bit more, either up or down - depending on what they can get away with. Though 1390 ES should be the EOD level. Thanks, dle7319. It's tough to watch these happen. You loosen your stop, wait it out, and then boom! In a second you are handed a loss and then the market moves the way you expected it to from then on. Doesn't it always need to have a wave 5 to complete the cycle? Spanish and Italian 5 year bond rates down 2% today. 1395-97 critical at this point, and no much time through the EOD for resolution. The scenarios I envisioned below remain. If 1395-97 is crossed with conviction, we would be at the early stages of another leg up, with a target of ~1415. If 1395-97 is retested and rejected, 1370-75 is likely. At this point I favor the first alternative, as NDX (and AAPL) remains strong. A gap up on Monday morning with AAPL opening at ~605-610 is possible at this juncture. AAPL BBs have strangled over the last few days, so a big move (up or down) should be expected, and my guess is up (not that I want, as I am holding some few April QQQ puts). I am afraid we will not know the answer until Monday. Does anyone know at what time U.S. bond/credit markets close? Is it 3 PM (ET)? MSNBC said that VIX's below pre-crisis level. To short or not to short... that is the question. Nice checklist and thought process. Thanks for posting. Amazing how the last few Fridays have been quiet for AAPL, trading within very tight price ranges... As suggested below, I am inclined to credit that to options trading and how price is manipulated in such low volatility, low volume environments, but have no further insight. Educational comments and opinions on this would be very welcome. Said a while ago on this site that my teacher told me the best traders are airplane pilots and engineers do not make good traders. Why?Because he said airplane pilots have check lists and follow them, if an engine is not tested before take off lots of lives are at stake. He said engineers were too bent on making something that is imperfect into something that is perfect. Not bashing but this is what he said, I want to follow up on the pilot part. I posted a chart of $VIX a while ago, think it was in Feb. or beginning of March stating that it was not ripe yet for entry. I think it was posted right about where the tan arrows are. I put a large yellow horizontal line on the chart and said it represented the high that had to be broken before anything would happen. This is how a pilot would approach this, no break of line -- with the other confirming things such as a rising stoch, a macd breaking the zero line, etc. no LT trade in fear products. AAPL options trader I know explained to me that OPEX days demonstrate the power of the market makers to determine where "they" want the market to end up. They run the show. Interesting timing. Note that the next Fed FOMC meeting is April 24-25. Good insights and an easy-to-use checklist for trading. Thanks! Regarding the comment about engineers as traders--well, I think a design engineer has his checklist too but he may not check all of them because, if something goes wrong with the product, you'll have to contact 1-800-support!!! AAPL, a riddle wrapped up in an enigma, or the conundrum. Lots of discussion about AAPL, has it topped? Short it? I think not, we will fall and when the stochs turn up again go to a new high. Careful of an ABC move here which will whip saw the best. This is standard in the EW with MACD analysis, up pressure appears under the EW3 but price has not died yet. And it can go up with the mrkt going down too. The 20/50 MA cross is just about to happen but think it will be a short lived event. A surgeon in a prestigious Boston hospital was wondering why there were so many post-operation complications. He decided to investigate and discovered a shocker: his brilliant surgeon colleagues made lots of mistakes and omissions. Had they used a checklist - pre and post operation, many of those mistakes and omissions could have been avoided. He proposed the idea of requiring before and after surgery checklists to the head of the hospital and was accepted. As an engineer for over 25 years I represent the individual trying to see and make something that is not there. This is my number one problem with my trading. I get in my head a certain idea, don't go through the objective, impartial analysis and my trades don't tend to end up well. Surprise! Duh. Thanks for the post. I really appreciate your posting of ideas and analysis. It really makes me think about how I approach the problem. Yes. Yes. Yes. My number one rule over the past 1.5 years is don't take the trade if I haven't filled out the checklist. I've been doing much better but I often surprise myself how tempted I am to jump in without filling out the checklist. thnx NWDR, my teacher's thoughts not mine about engineers. I am actually not good with numbers, sure I can do them, so the visualization is what I do well at, seeing relationships in wave structures, candle identification, pattern memorization, etc. wow, we are all human. amazing story Albert. again t_winn, from my teacher who had the experience of teaching EW to persons of all walks of life over his years. The pipeline is filling up with new issues, always happens near a top. This is how you play them. One might catch the initial pop, then there is a sell off as it locks the late comers in. There are also those ppl who are locked up. It goes dormant for periods of time, sometimes for months as PALL did. What is interesting about this one is the constant of three tests in both cases before the break outs. New issues have no charting history to follow for TA so it is pure underlying TA with stochs & MACD. I'd like a few redos. How about buying AAPL and forgetting it.